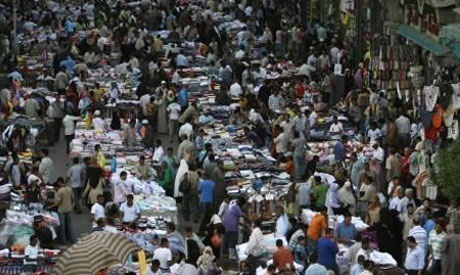 Egypt's Central Agency for Public Mobilisation and Statistics (CAPMAS) says that country's population reached 96.3 million in early 2018. A report issued on Wednesday said that Egypt’s population increased by 1.5 million since the last population census was taken in September 2017. Some 34.2 percent of Egypt’s population are under the age of 15, CAMPAS said in its report, which was issued on World Population Day. CAPMAS added that 51.6 percent of Egypt's population are males, while 48.4 percent are females, with a ratio of 106.4 males for every 100 females. Cairo is the most populous governorate in the country with 9.7 million residents, followed by Giza at 8.7 million. Population density increased from 71 p/km2 in 2006 to 95.3 p/km2 in 2018. Those over the age of 65 are 3.9 percent of the country's population. Those aged 15 to 65 comprise 62.8 percent of the population. Some 57.4 percent of the country's population live in rural areas, while 42.6 percent live in cities. In September 2017, CAPMAS said that some 94.98 million Egyptians live inside the country while 9.4 million live abroad.